Jet Air will be available Thursday from 7 a.m. to 5 p.m. and regular hours Friday. Jet Air will also be available after hours for callout at 319-248-1200 (fees apply). Self-serve Avgas and Jet-Air available around the clock. Animal Care and Adoption Center: Closed both days. Cemetery: Office closed both days. Artificial wreaths and flowers, or other decorations may be placed on graves for the holidays. These materials will remain in place through February. If not claimed, they will be removed. Landfill and Recycling Center: Closed Thursday. Open regular hours Friday, 7 a.m. to 4:30 p.m. Leaf Vacuum: No service Thursday. Plans to continue Friday, weather pending. View the latest schedule at www.icgov.org/leafvacuum. Library: Closing at 5 p.m. Wednesday; closed Thursday; Open 10 a.m. to 6 p.m. Friday. ICPL Bookmobile: No Bookmobile service on Wednesday and Thursday. Parking: Office closed both days. Ramps and meters will not be enforced on Thursday. Ramps will be free on Saturday for Small Business Saturday. Meters will be enforced. Parks and Recreation: Administrative offices closed both days. All facilities closed Thursday. Recreation centers will be open 11 a.m. to 9 p.m., and pools 11 a.m. to 8 p.m. Friday. Police: Administration and Records offices closed. Patrol and station masters on duty. Refuse, Recycling and Organic Waste: No curbside collection on Thursday. Normal operations Friday. Residents on Thursday and Friday routes: have materials to the curb by 7 a.m. Friday. Reduce holiday waste: compost at the curb. More: www.icgov.org/thanksgivingwaste2018. Senior Center: Closed both days. No senior meals. Transit: No service Thursday. Saturday schedules in place Friday/Saturday at no cost to riders. No free shuttle service Monday, Nov. 19 - Friday, Nov. 23 due to UI Thanksgiving break. Water: Closed both days. For a water emergency, call the 24-hour emergency line at 319-356-5166. 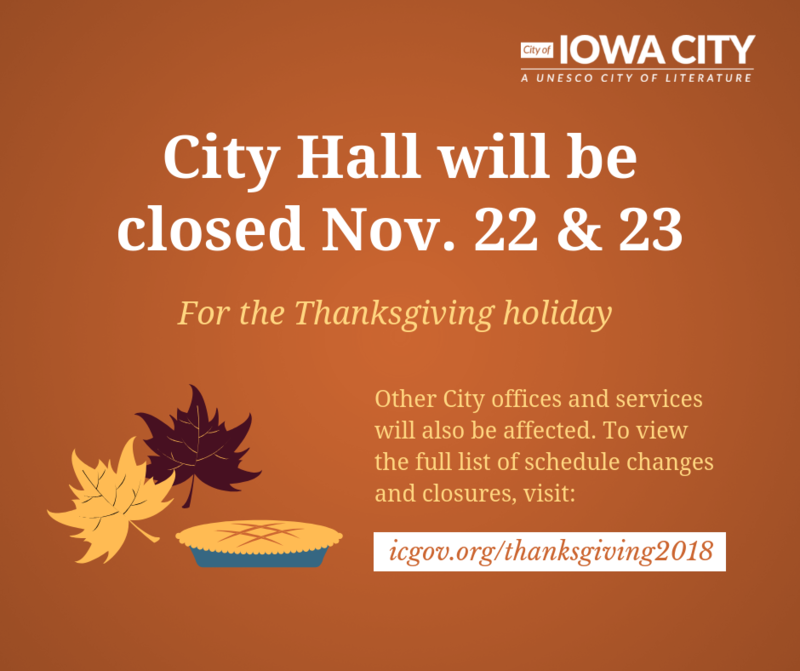 City offices and operations will return to normal schedules on Monday, Nov. 26.